Like 25 million other people I was glued to the Royal Wedding of Meghan and Harry. Perhaps inevitably, I found myself glancing at a framed photo of my own wedding, thinking back to how I felt on that day. I remember the hotel had an evening room service, where our bed clothes were turned down and fortune cookies supplied. That first night, my husband got a message saying that he would welcome many artistic and literary minds to his house. I got a warning to watch my waistline. Funnily enough, down through the years we have hosted many a happy dinner party and BBQ. And equally, my waistline has expanded and contracted like a yo-yo. One thing I don't regret is developing my ability to cook. It's still a bit trial and error but I've enjoyed trying out new recipes, learning techniques and indulging my guilty pleasure of pouring through cook books, feasting my eyes on pictures of dishes I imagine eating (but will never make). I do love acquiring a new cookbook whether it be purchased or loaned from the library and looking at all the different ways to blend meat, vegetables and carbohydrates. My latest buy has been A Table in Venice by Sky McAlpine frommydiningtable.com/book , mostly because it reminded me of my trip to Venice this time last year but also because I adore regional Italian cooking and I seem to be just about master it. I love the use of simple and fresh ingredients yet delivered tastly. 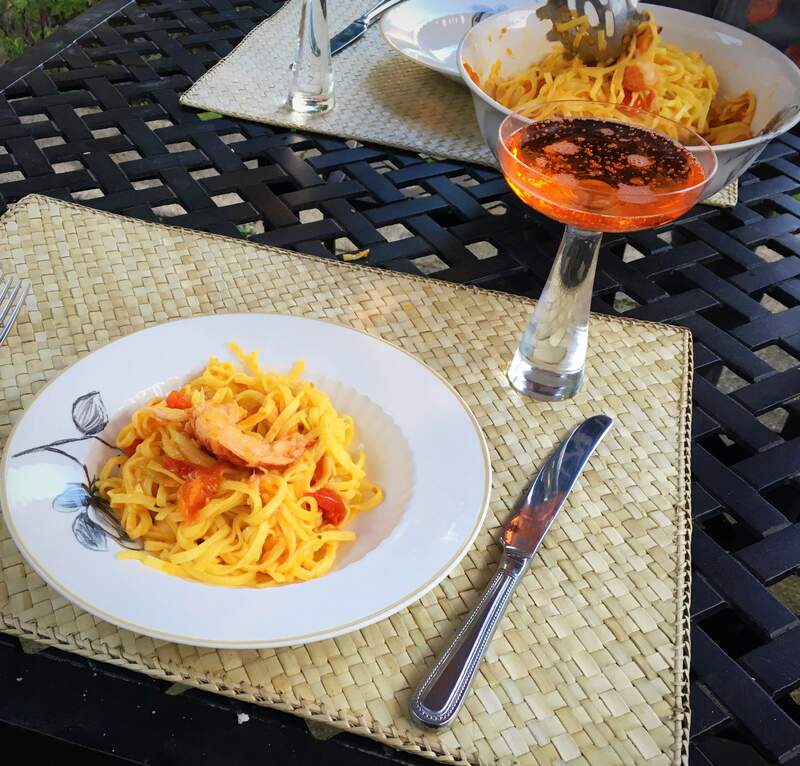 I sat down, planned which meal I was doing, got the ingredients locally and threw together a delicious lobster pasta which we had whilst dining al fresco in our back garden. Kids were impressed, other half was impressed, I was impressed.... and relaxed. People talk about cooking at home being better for you dietwise than eating out or purchasing ready meals. It's debatable if it's more cost efficient given the costs of some foodstuffs - baking cakes is a point in question, where you wonder if you are better off just donating the money to charity rather than making traybakes that cost the best part of a tenner to make only to sell at 20p a slice at school. I digress as quite simply cooking is good for you mentally as it is physically. There is something very satisfying making a dish that is lapped up. You can see the immediate outcome of your inputs. And if it's a disaster, you get to laugh about it. Another of my food heroes Deb Perelman (of smittenkitchen.com fame) is known for whipping up creations in a tiny NYC kitchen (no excuses not to cook!) but in the foreward to her new book Smitten Kitchen Everyday, she writes about how growing a family from three to four changed her cooking habits. Previously, she cooked for her and her husband with an extra portion for her son but having had a second child, she suddenly found that children had different eating routines to adults with different dietary needs. Eating times had to be prearranged and organised. She points out that cooking became an escape from the routine day, a time to be creative. It struck a chord with me. Just like people do minfulness apps, I use cooking at the end of a working day to switch off. I sometimes have planned in advance (having rummaged through my cookbooks) or it comes to me as I open the fridge door. Either way, for the duration of cooking, I'm no longer Dr Cath nor am I a responsible grown up parent. I'm completely Zen. And to make it even more achievable, I still implement Sophie Wright's 'Home at 7 Dinner at 8' ethos.